RUSH: We hear stories about fires in southern California all the time. 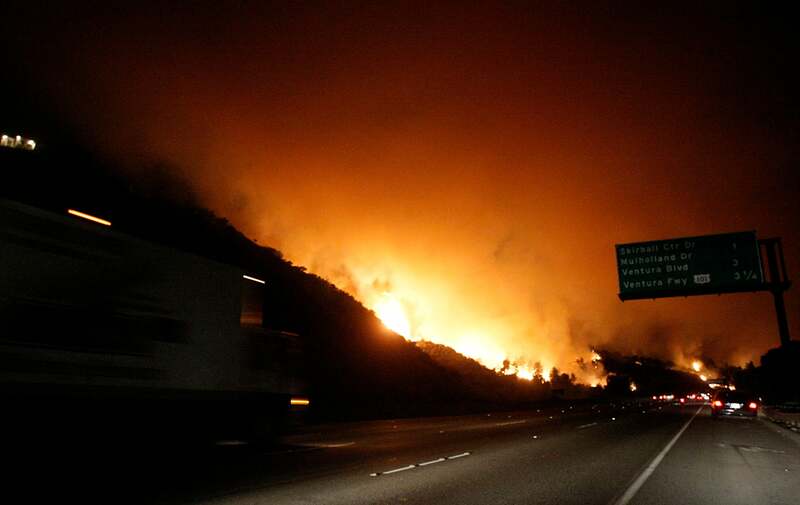 They usually happen in the spring, late spring and the early summer, and they happen frequently enough that people don’t pay a whole lot of attention the farther away from the fires they live. But a fire started at 5:30 this morning out in California. I mean, this is Los Angeles, this is Bel-Air, this is Brentwood, potentially, this is Beverly Hills, potentially, Hollywood. This is the 405, which is the busiest highway in America on certain occasions. It’s essentially a north-south artery. Your navigation system in your car will call it the 405, but locals call it the 405. It basically runs north-south, but it’s more north-northwest, south-southeast. It runs right by the Getty Center, and the fire is right across the interstate, right across the highway from the Getty Center. The Getty Center is one of the primary art museums in the area. I take the route when I’m out there. This is the route that I take going to work every morning at 5:30, five a.m. straight out of Beverly Hills, hit the 405, zip up there. I’m not gonna tell you the final destination, ’cause that means the next time I’m there, there will be crowds outside the building. But that’s the highway I take to get where I’m going. They’re smirking in there on the other side of the glass. But, folks, this is not out in some wilderness area. This is Bel-Air, the northern reaches of Bel-Air south of Sherman Oaks to what would be the east of the 405. Reagan lived in Bel-Air. I joke that the average home price in Bel-Air is $30 million. There’s a guy named Gary Winnick who made a whole bunch of money in a funny way during the Clinton years. He was part of a fiberoptic company that was involved in some sort of shenanigans. He bought a $65 million home that overlooks the Bel Air Country Club. Every time I play the course, we all point it out, there it is, wonder what Winnick is doing up there. Similar, Michael Jackson’s home that he lived in when he died, Holmby Hills, are just right down the road from where this is taking place. Now, the fire has not reached, at least when the program started, hadn’t reached far enough south to get to Beverly Hills or even the Bel-Air Country Club. You can look at this on a map. If you find Mulholland Drive, which is big, Nicholson lived there, if you look at Mulholland Drive where it intersects the 405, you’ll see Sherman Oaks to the north and Bevery Hills, you’ll see where this is. This is not out in the valley. This is Hollywood. This is LA. This is bad. RUSH: NBC News has reported (it’s in TheHill.com) that Rupert Murdoch’s home in the Los Angeles area near Bel-Air has burned to the ground. It’s a 7500-square-foot structure on a winery about five miles from the ocean at 900 feet on the side of a mountain, and it’s toast. It’s burned down. This fire is not the usual, you know, in the canyons with occasional homes in the way. They’re calling this the Skirball Fire, started at 5:30 this morning, and it’s just… It’s burning right across the 405, south of Sherman Oaks and down into Bel-Air and spreading. Right now, I think they said 50 acres. That may be a while ago. But this is Hollywood. This has the potential here to be biblical if they don’t get this under control.